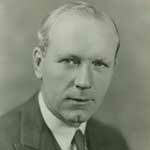 Few names are more recognizable in Nova Scotia than Angus Lewis Macdonald (1890-1954). Most Nova Scotians remember him as an ardent orator, a formidable premier and the namesake of Halifax and Dartmouth’s first harbour bridge. Cape Bretoners also remember him as the prodigal son of Inverness County, the man who linked the island to the mainland with the construction of the Canso Causeway. And to Dalhousie, he’s a distinguished alumnus, former professor and continuing source of pride. Often compared to fellow former premier Joseph Howe in oratorical prowess and impact on the province, Macdonald is credited with leading Nova Scotia out of the Great Depression, overhauling the Royal Canadian Navy during the Second World War (a task for which he was personally chosen by Prime Minister King) and fighting relentlessly for political autonomy until his sudden death, while still premier, in 1954. Hard work and perseverance were tenets of Macdonald’s early years. Growing up in a large Catholic family in rural Cape Breton, nothing was handed to him. To finance an undergraduate degree at St. Francis Xavier University, he worked before, during and after his studies as a public school teacher to afford tuition. Called to duty in 1915 during First World War, he left for Britain and served in heavy fighting in the fields of Belgium. Returning from war after recovering from a bullet wound to the neck, Macdonald excelled at his new home: Dalhousie. Graduating from Dal’s Law School with high honours in 1921, he joined the teaching faculty three years later. Though engaging and effective, his classroom career was cut short by an unlikely thrust into public life. After a failed attempt at running for a federal seat in his hometown riding of Inverness, Macdonald was surprisingly, even to him, catapulted into the leadership role of the provincial Liberal party without any real political experience. Following victory in the 1933 election, Macdonald set out to employ the droves of unemployed workers caught in the depths of the Depression by embarking on a massive series of province-wide infrastructure projects. Serving twice as premier (‘33-’40, ’45-’54), the effects of Macdonald’s leadership still ripple throughout the province in the paved roads we use today to crisscross the province, and the spans we use to cross waters near and far. It’s that ambition and drive that captured the imagination of the province, and Dalhousie, years ago — and why his legacy still resonates today.